The Syrian civil war has been raging for half a decade now, and the scars show more than ever. The drone footage below show parts of suburban Syria totally destroyed for as far as the eye can see. It is amazing to think that humans live in this horrific battle zone, but they do. 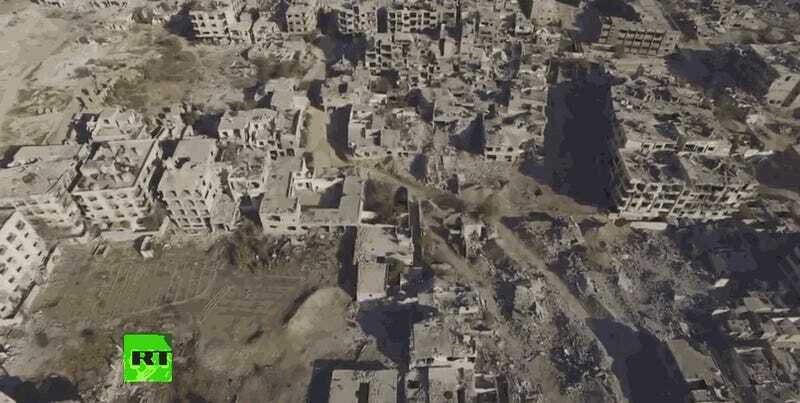 The video was shot in parts of Jobar, once a highly populated neighborhood in outskirts of Syria’s Capital, Damascus. It has since been the center of intense fighting between Assad’s forces and rebel groups. Now the area is a wasteland where houses and shops are occupied by opposing factions that may differ from block-to-block and where misguided weapons can fall from the sky at any moment. Tunnels run through the area as well, making the fighting totally unpredictable and extremely deadly. At a certain point, you have to wonder what they are really fighting for, as destruction like this will take a generation or more to rebuild.